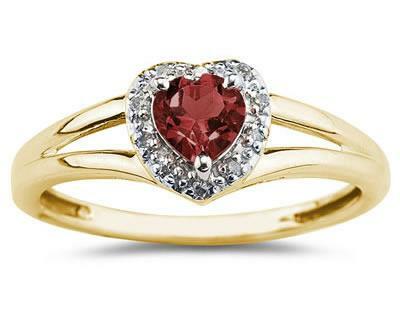 When set in yellow gold, the dark crimson red of garnet jewelry reveals such beautiful complimentary colors, creating a combination that you cannot help but fall in love with! Perfect for a date night with your significant other or a special event, yellow gold garnet jewelry can make any attire look more elegant and beautiful. Garnet, the gemstone known for being given for a second wedding anniversary, is also the birthstone for the month of January. Necklaces, earrings, bracelets, stud earrings, pendants, and rings make up a large selection, from engagement rings to floral necklaces, to vintage earrings. Choose from several cuts, including round, oval, cushion-cut, emerald-cut, heart-shaped, and trillion-cut. Backed by Apples of Gold Jewelry's 45-day return policy, you can choose a design that suits you, or experiment with something new.